Back to Oklahoma with the Western Conference semis tied at 1-1. Dion Waiters shoved Manu Ginobili before inbounding the ball. THE OKLAHOMA CITY Thunder beat the San Antonio Spurs in Game 2 of their Western Conference semi-final last night, an all-time classic that could be remembered more for a missed call than the excellent back-and-forth. After a clutch three-pointer and three clutch free throws from LaMarcus Aldridge to bring the Spurs back to within a point of the Thunder, the Thunder were inbounding from the sideline with 13.5 seconds to play. The Spurs were going to foul to stop the clock and send the Thunder to the free throw line. What followed was a wild sequence. Thunder guard Dion Waiters threw a forced pass to Kevin Durant at mid-court. Durant lost his footing and lost the ball, and the Spurs recovered it. San Antonio opted not to call timeout. Manu Ginobili drove toward the paint and threw a pass to guard Patty Mills in the corner for a game-winning three-pointer. Mills missed the three, and there was a frantic scuffle under the basket for the rebound, when time expired and the Thunder held on for the crucial win. However, what had the Spurs and the NBA world up in arms was the uncalled foul on Waiters on the initial inbound. As Ginobili guarded the pass, Waiters reached over the sideline, shoved Ginobili, then inbounded the ball. TNT analyst and former NBA player Chris Webb angrily went off on the no-call, because it may have affected the game. Waiters, of course, is not allowed to reach over the line and shove Ginobili. Had the refs called the foul, San Antonio would have gotten the ball back and could have called a timeout, thus negating the entire sequence that happened thereafter. Charles Barkley echoed Webber from the TNT studio after the game, saying he had “never seen that” in his time around the NBA. However, the no-call on Waiters is not the only potential missed call by the refs. 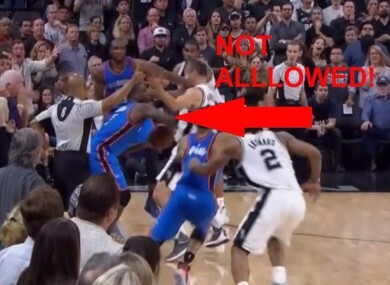 Ginobili could have been called for a violation as well for appearing to step over the sidelines on the inbounds pass. In other games, it would not have been shocking to see the Spurs called for a foul while stripping Durant on the pass. Similarly, Aldridge may have been fouled on the offensive rebound after Mills’ missed three. In some senses, these missed calls all cancel each other out, but Waiters’ shove remains the most blatant. The NBA releases a report on the officiating of the final two minutes of a game the day after the game, and it will be interesting how the league breaks down this sequence. For now the series shifts back to Oklahoma City, tied at 1-1, after what could be a series-changing play. Email “Thunder level series against the Spurs - but the refs missed a huge call right at the end”. Feedback on “Thunder level series against the Spurs - but the refs missed a huge call right at the end”.